Commissioner Elia and Chancellor Tisch came to Rockland County Thursday to announce that they were appointing another monitor for East Ramapo. Commissioner Elia said she was “extremely troubled” and that “We recognize the seriousness of the situation.” However, the actions the education department is taking seem not to rise up to the seriousness of the problem. We wrote to the Commissioner of Education in 2009, describing basically the same problems that the fiscal monitor found in 2014. While the state waited to act, hundreds of teachers were fired, programs were cut, and students suffered. The fiscal monitor issued a scathing report, but didn’t call for removal of the board. While he was conducting his study, the board sold two schools for less than their assessed value. We are not ungrateful. We only want equal treatment. We want students in East Ramapo to have an education equivalent to what students in other Rockland districts have. We want NY State to act swiftly to remove the board and place our district in receivership while the issue of governance by a “not so simple majority” is resolved. The whole world is watching. If you do not accept second class status, YOU MUST COME OUT and protest at the school board meetings. Invite your friends! Make a sign! If not now, when? 892 Route 45, Chestnut Ridge, NY. If there is one person who is most responsible for the degradation of East Ramapo, it is Aron Wieder. In Nov, 2009, Aron Wieder brought Al D’Agostino to East Ramapo. In June of 2011, the school board majority, led by Aron Wieder chose Dr. Joel Klein instead of Pedro Santana for Superintendent of schools. Last year Mr. Wieder (now a Rockland County Legislator) spearheaded the effort to block legislation that would have provided a check on the actions of the school board. Rev. Jacques Michel previously held the seat the Mr. Wieder now occupies. As a legislator, Rev. Michel passed legislation opposing the sale of elementary schools. He participated in rallies along with parents. He is now running in the Democratic Primary on September 10 (yes, it is on a Thursday). This time, there is no other candidate to ‘split the vote’. Please join Citizens for Rev. Jacques Michel for a Fundraising Barbecue on Saturday, August 22, 2015 from 6:00 PM– 8:00 PM, at The United Saints Church, 115 South Main Street, Spring Valley, NY. For Information or to RSVP 914.260.4118 or ToPreventCrime@aol.com. Please make all checks payable to: Citizens for Rev. Jacques Michel, 115 South Main Street, Spring Valley, NY 10977. We Hope To See You There! I am thrilled to announce our first action of the new school year. While we are glad that Dennis Walcott and his team are in town, we must do the advance work of being prepared for the 2016 legislative session, given that Walcott’s team does not have formal authority to reform the district directly. This means building our support across the state to be ready to pass a strong oversight bill. 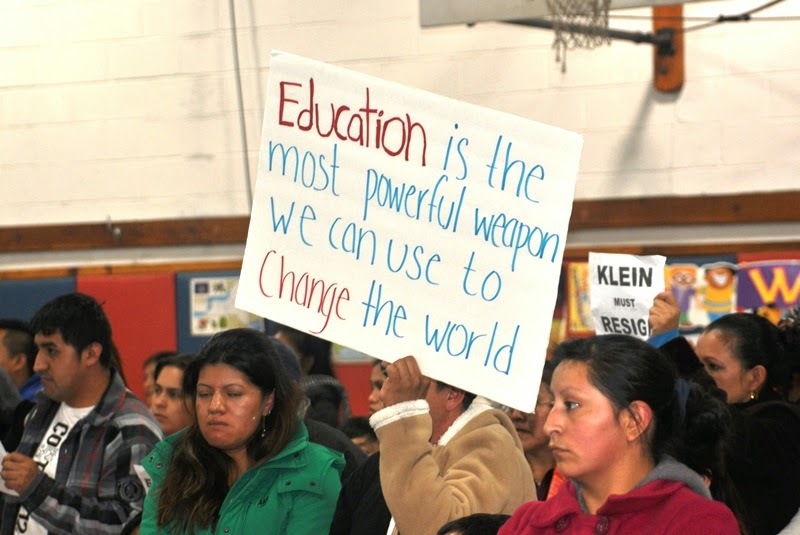 In a series of actions that will culminate in being ready for an Albany visit in early January, Strong East Ramapo will be leading our first trip to Long Island on Tuesday, September 8 (the day before the first day of school). The trip will aim to forge relationships with allies who will pledge to lobby Senator Flanagan on our behalf for veto power when the time comes. We plan on leaving Rockland in carpools from Spring Valley starting at 2. Visit www.strongeastramapo.org/action to RSVP and to receive more information. We need you there! Education Commissioner Elia and Chancellor Tisch will be visiting RCC on Thursday at 1:30 PM to make a major announcement about the state’s plan to address the needs of East Ramapo. Please make every effort to attend so we can fill that room and demonstrate our commitment to quality public education. Advocates for Justice has filed a new lawsuit on behalf of East Ramapo taxpayers and parents seeking to recoup excessive legal fees paid by the school board. As reported in the last update, NY Supreme Court Justice Bucaria found that the school board had overpaid lawyers in one case by over $2 million. Advocates for Justice seeks to recoup that money for the district and prevent the board from further excessive legal spending. Also, A4J has filed an appeal with the Commissioner of Education asking that the school board members be removed for violation of their fiduciary duty. School board members in NY are required to exercise the degree of diligence, care, and skill in handling the district’s money that an ordinary prudent individual would use in handling their own personal finances. In the case decided by Judge Bucaria, he said the board spent $2.2 million for legal fees when a reasonable amount would have been $187 thousand. Clearly they were not prudent, not careful, and spent an extraordinary amount of money. The judge’s findings echo the findings of Fiscal Monitor Greenberg. They confirm the initial reaction of parents when they heard about the outrageous legal fees agreed to by the school board. Sued the State Education Department to prevent them from blocking the board’s policy of paying private tuition with public money. Appealed the decision of the NY Supreme Court when they lost that case. Sued the NY Attorney General’s Office to prevent them from accessing records related to the sale of Hillcrest Elementary using a false instrument (an appraisal). Violated the contract of former superintendent Outstacher and had to pay his legal fees. Sued their own insurance company that declined coverage for board members’ conduct. What other board can you imagine that would actually try to prevent a law enforcement agency from investigating a potential fraud against the corporation that they are entrusted with governing? Can you imagine if the East Ramapo board all ‘owned stock’ in the corporation they govern, would they behave this way? Have they been acting as if guarding the finances of the district was guarding their own personal finances? Or have they abused their power and betraying their oath? We think it is time for a judge to decide. Advocates for Justice is a public interest, not-for-profit law firm. They are not charging for the work they do. There is no contract with plaintiffs for payment when the case is decided. There is no charge to the plaintiffs for the work they do, period. Your donations are what makes this possible. That the victims have a voice, that they get their day in court, that our system of justice functions not only for those with the money. Donations are tax deductible. They can be spread out into monthly payments. They are what sustains the avenue of legal recourse for our families. Please take a moment now to support those who fight for our children, who fight for their right to a sound basic education.